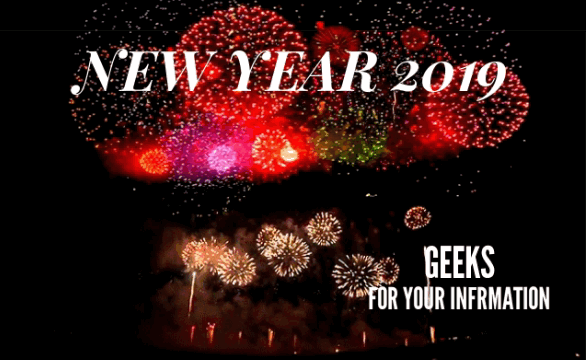 PowerISO New Year 2019 Giveaway! PowerISO is a powerful CD/DVD image file processing tool, which allows you to open, extract, create, edit, compress, encrypt, split and convert ISO files, and mount these files with internal virtual drive. It can process almost all CD-ROM image files including ISO and BIN. PowerISO runs on Windows98/Me, Windows2000/XP/2003/Vista/7/8/8.1/10 or above. PowerISO's Virual Drive runs on Windows2000/XP/2003/Vista/7/8/8.1/10 or above. Convert image files between ISO/BIN and other formats. You can convert almost all image file formats to a standard ISO format file. 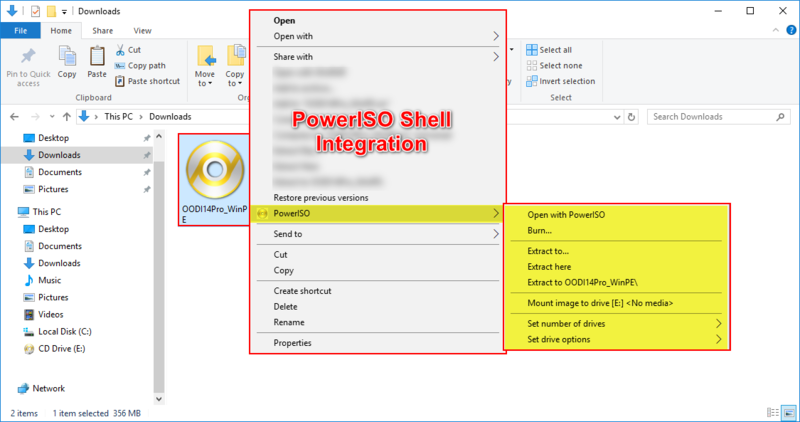 PowerISO support shell integration, context menu, drag and drop, clipboard copy paste etc. Support all PowerISO function, which is extremely easy to use. Functions are segregated for easy access and viewing. See image below. A system tray program, allows you use virtual CD/DVD-ROM drive more conveniently. 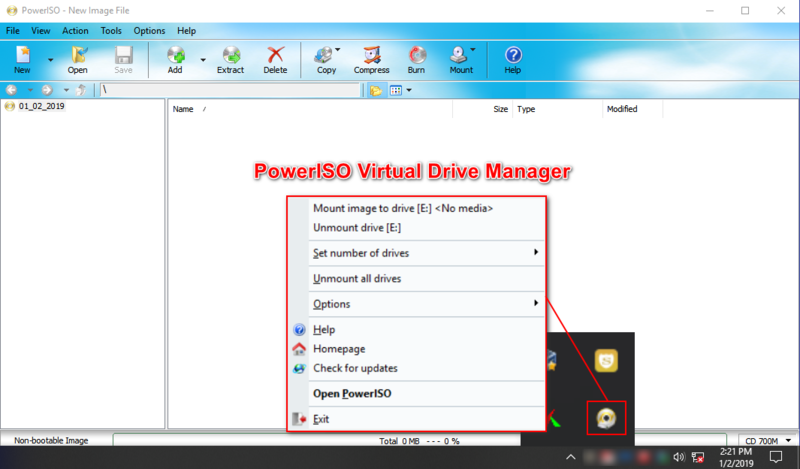 PowerISo Virtual Drive Manager can be set via "Opions > Configuration > Virtual Drive. PowerISO supports tight integration with My Computer and Windows Explorer allowing easy access/usage as required. 300MB with the unregistered version. Except these, all other functions or features are the same. Usage of PowerISO is pretty “extremely” easy and self-explanatory because the commands are all within reach either via the “Main Menu”, Toolbar or the right-click function. Some examples are shown below. There are various ways to create an image file (ISO, BIN / CUE, DAA) but the easiest way is to select "New" in the toolbar or click the drop-down arrow to select more options. The user can also access "New" function via the menu bar by clicking "File > New" and choose "Data CD / DVD Image". Files can also be dragged directly to the PowerISO wndow. You can select the type of storage medium depending on the size of your data also. To create a “New Folder” within the new file the user can go to “(Main Menu >) Action > New Folder”. To change the label of that folder (rename) user can do it via right-click function and choosing “Rename” or via Action > Change Label”. To save the image file, click “File > Save”, via the “Toolbar > Save” or via the right-click function. 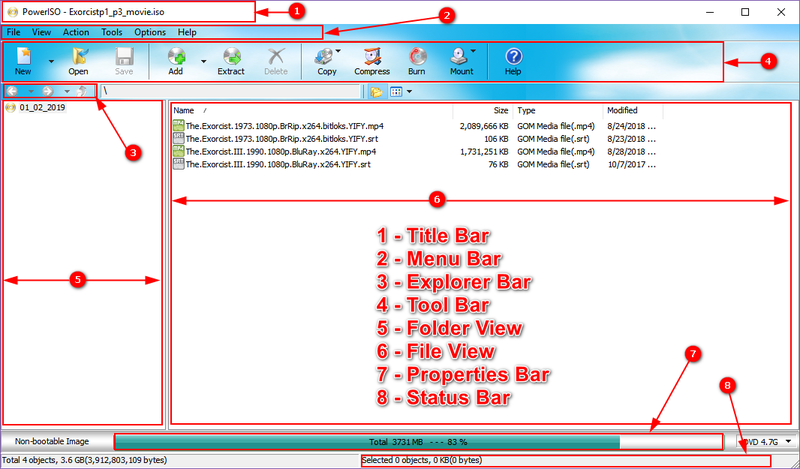 Open the image file in PowerISO via “File > Open”, click “Open” in the Toolbar or via the right-click. As the image file is open in PowerISO, select “Extract” in the Toolbar or either Main Menu > Action Extract, or via the right-click function. The “Extract Image Dialogue box” will appear. Make sure that you have selected “All files”. Enter the destination where you want the files extracted and click “OK”. To select specific files or folders inside the opened image file (in PowerISO) you just have to select it and click “Extract”. The “Extract Image Dialogue box” will appear and you have to enter the destination where you want the specific files/folders extracted. Click “OK” to execute. 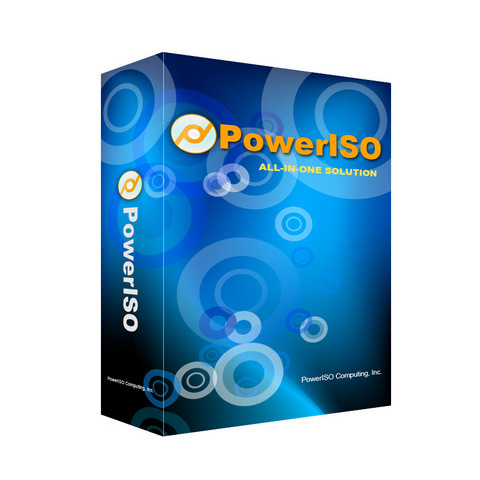 User must first open the target ISO / image file for editing in PowerISO. To add files/folders to an existing ISO / image file, you can either use the Add > Add files and folders in the Toolbar, or Action > Add files and folders in the Main Menu, or via the right-click function. Click to save the new edited image file. (“Saves As” if you want to save it with a different file name). To “delete” files/contents inside the existing ISO / image file, the same rationality (as mentioned this is ‘extremely” easy -- even your kid will know what to do! ), select the file or whatever content you want deleted and select “Delete” via the Toolbar, “Main Menu > Action” or right-click function. To add a folder in an existing ISO / image file, go to “Main Menu > Action > New Folder” or via the “right-click function > New Folder”. To rename that folder go to either “Main Menu > Action > Change Label” or “right-click function > Rename”. (Note that the F2 function can also be accessed after you select the target folder to be renamed). Click to save the new edited image file. (“Saves As” if you want to save it with a different file name). To convert an image file, the user must go to “Main Menu > Tools > Convert”. Select the “source file” (#1) which is the target file to be converted and select the destination of the converted file(#2). For the Output imgae format (#4) Let it be noted that currently the destination format can only be ISO, BIN/CUE or DAA. The “Covert Image Dialogue box” will also show (#3) for password protection and “More Settings” (marked #5) where additional inputs/comments can be added. WIM (Windows Imaging Format) files are very similar to other disk image formats and is now always present in the subsequent Windows OS builds. A WIM file may includes several images. PowerISO, can open an WIM file, and extract files from the WIM file. The user has to select the WIM file to be opened and from there click “Extract”. Select the destination drive (for the extracted file) and click “OK”. In this example the ISO file from which the WIM file came from is a Windows 10 1607 RS1 ISO file. The selected WIM file is the “install.wim” located in the “sources” folder. New in PowerISO version 7. 3 is the capability to convert ESD-to-WIM and vice versa. One thing to remember is that when using the "WIM to ESD Converter" (Tools > WIM to ESD Converter) PowerISO should be run as Administrator. See images below. PowerISO version 7. 3 now included creation of 7zip and ZIP archive file creation. All the user has to do is to select the file/folder and choose "Save As" > select either 7z or ZIP in the "Save as type" drop-down box. Can convert esd-to-wim and vice versa. "WHAT feature/s do you like best in the new version of PowerISO?" +) You can create Zip and 7z files. +) Audio file format conversion support. Supports Audio CD creation from M4a files. Thanks for the opportunity to win in this giveaway. "WHAT features do you like best in the new version of PowerISO?" POWERISO is one of my favorite software. It was originally complete solution to manage all image file formats so that you can create, edit, burn, delete image files and create Bootable media which is of great help to all users. Additionally the software is light and doesn't cause slowing down of the PC and easy to use. My favorite feature in the new version of the program is the creation of ZIP and 7z files. I often deal with ZIP and 7z files, so this new feature in the program is very helpful. the program supports the following formats: ISO, BIN, NRG, CDI, DAA, MDF, BWI, B5I, LCD, CIF, P01, PDI, NCD, PXI, GI, FCD, VCD, C2D. The program integrates with the operating system. The program's interface is very simple and transparent in the same way as the whole application, which is characterized by lightness and speed of operation. The application supports drag and drop. It is worth mentioning that we can mount more than 20 virtual drives. PowerISO is a powerful CD/DVD image file processing tool which can open, extract, create, edit, compress, encrypt, split and convert ISO files and mount ISO files with internal virtual drive. You can do everything with your ISO files and disc image files. 1. What features do you like best in the new version of PowerISO? The features I like most are the ability to create zip and 7z files and can convert esd to wim and vice versa. These provide me with more flexibility and ease using the tool and no need to apply extra tools or softwares to complete the tasks like before with v7.2 or lower versions. WHAT feature/s do you like best in the new version of PowerISO?" I like that it now supports creation of zip and 7z files which adds another useful feature to the already powerful, light and reliable ISO managing, creating etc. software. In PowerISO I like the support of working with all major image formats. convert ISO to BIN and Vice versa, open, extract and edit the disk image file, burn the disk image to any optical media and USB flash drive. Thanks for this contest! Thank you PowerlSO!